SportsBetting Terms Defined, part 2 continues with terms for passionate handicappers and new players who want to learn about this popular form of betting. Some of the unique betting terms, jargon and betting options are Goliath, Handicap types of bets, If Bets, Lock, Mixed Games and examples of Over/Under Bets. Getting Down: place your bet. Goliath: whoa–the mother of multiple bets that includes 247 bets for several events. Grand or Big'un: A £1,000 bet. Grand Slam: refers to the 4 four major tennis tournaments Wimbledon, Australia Open, French Open and U.S. Open. Additionally, the 4 four major golf tournaments, The Masters, U.S. Open, British Open and PGA Championship: Professional Golf Association. For baseball, a Grand Slam is a homerun while all bases are loaded, thus scoring four runs. Group Winner: predicting the team to be the group winner. Half-Time: betting on the half-time results. Half Time/Full-Time: 2 bets in 1 based on the results of half and full time.Both choices must be correct to win excluding overtime. Handicap SportsBetting Terms Defined: Types:Below are a few examples for these bets. Handicap 0: your chosen team wins. If there is a draw, your bet is refunded. Handicap +0.5, +1: your chosen team wins or draws, but if your team loses by 1 goal, you lose 50%. Handicap +1.5: your chosen team wins, draws or loses with a one-goal difference. Handicap +2.5: your chosen team wins, draws or loses with a goal difference of less than three. Handicap -1: your chosen team wins with a goal difference of two or more. If your team wins with a one-goal difference, you are refunded your stake. Handicap -1.5: your chosen team wins with a goal difference of two or more. Handicap -2: your chosen team wins with a goal difference of three or more. If your team wins with a two-goal difference, you are refunded your stake. Handicap -2.5: your chosen team wins with a goal difference of three or more. Handicapper: professional who researches all aspects of the game before betting. Hang Cheng: Asian slang for Point Spread. Head 2 Head: betting on which team member scores the highest vs. the team member against him/her. Hedge: to decrease the action by betting the opposite of a previous bet. Heinz: 57 bets: include 6 selections for several events. Highest Half: betting on highest total score of a chosen half. Basketball and American Football are popular games for this bet. Home Field Advantage: refers to advantage home team based on fan support. Hook: half point in point spreads. For example, 3 1/2, 3 and a hook. Hoops: jargon used to indicate the game of basketball. 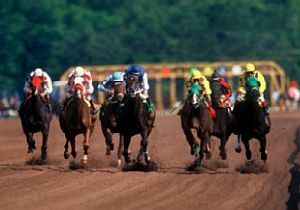 Horseracing: known as the sport of kings, horseracing is arguably the most popular sportsbetting venue. This could spark a debate with soccer sport bettors. If Bets: placed based on an ‘if clause’ with betting selections/teams for football, basketball and baseball games. Thus, when the bettor’s first ‘if bet’ is correct, they move on the second ‘if bet’ until the selections/teams they bet on is not in their favor. In and Out Teaser: lingo for a combo selection of the favorite, underdog and over and under for the same event. In The Red: lingo for Odds on. Index Betting: refers to spread wagering. Joint Favorites: jargon for 2 teams that are equally able to win the game. Jolly: UK jargon used by Bookmakers referring to Favourite. Juice: commission that goes to the house, also known as vigorish. Kite: UK lingo for a cheque. Lay a Bet: refers to a bookie accepting a bet. Layer: yet another term for a Bookie. Layoff: bookie's bet with another bookie to balance the wagering he has received from his clients. LBO: abbreviations for licensed betting office. Lengthen: lingo for odds that are moving longer resulting in an advantage for bettors. Linemaker: term for individuals who set betting lines. Lines: jargon for game odds. Live Bets: betting on a specific sport game during live play. Lock: lingo for easy winner. Long Odds: lingo for odds that are more than 10 to 1. Lucky 15: refers to a group of 15 wagers relating to 4 picks in different events. Lucky 63: refers to a group of 63 wagers relating to 6 picks in different events. Margin: record of difference between winner of event and other finishers. Mixed Games: betting on a virtual game between two teams. You are comparing the goal difference between two teams that are not actually playing each other but rather two other teams. The wager encompasses a 90-minute period without extra time or penalty shots for the number of goals scored. Most Goals: betting on the time period that has the most goals in the game. Money Line: is established by the casino in-house or purchased from a company or individual who calculates or makes betting lines. The casino’s commission or vigorish is built into the winning bets, just like a banker bet at the baccarat table. The purpose for the casino is not to bet against the bettors, but to provide an equal opportunity for bets on both sides, so the casino does not end up paying out more money than it takes in. It is the line maker’s job in creating the betting line to utilize a method of handicapping that will penalize the favorite bet and strengthen the opposition bet. This betting line can rise and fall up to the start of the contest allowing the casino sports book to gather as many bets as possible on the under-bet team, thereby, eliminating steam (heavy action on one side) and establishing a profit no matter who wins the contest. You lay, or give odds when betting the favorite, thus laying or giving a large bet to win small, or taking odds on the underdog (dog) small wager to win big. MVP: abbreviation for Most Valuable Player. NCAA: National Collegiate Athletic Association. Odds: bookie's analysis of the chance of a win for an event, to include profit. Odds-Against: term for odds that are more than even. Odd-Even: betting on whether total goals at the finish will result in an even or odd number. Odds-On: refers to payout in the minus or the amount bet to win $100. Oddsmaker: sportsbetting terms for persons who set the odds that are used by sportsbooks or bookies. Off the Board: no betting accepted, usually in the case of injuries. Outright Bet: win or lose bet on the outcome of the sport game or race. Outsiders: jargon for team or competitor who is a long-shot to win, therefore, lengthy odds are offered. Overtime: wager that sport game will result in overtime. Over/Under: wagers on the combined number of points scored in the game by both teams. Examples of over/under sportsbetting terms follow. Over/Under 2 goals line: event must finish with less then two goals or more than two goals. If one goal or less is scored, the under bets=winners and over bets=losers. If two goals are scored in the event, all bets are void. If three goals or more are scored, under bets=losers and over bets=winners. Over/Under 2.5 goals line: event must finish with 2 goals or less scored in the event. Under bets=winners. If 3 goals or more are scored in the event, over bets=winners. Over/Under 3 goals line: event must finish with 2 goals or less scored in the event. Under bets=winners. If 3 goals are scored in the event, all bets are void. If four goals or more are scored in the event, over bets=winners. Parlays: combined bets on several games or events. Patent: combo bet includes 7 bets and 3 selections for different events. Permutations: refers to 'perm' selections. For example, if you have made 3 selections, A, B and C, you can 'perm' all the possible doubles. Therefore, for this example, all the doubles possible would be AB, AC, and BC for a total of 3 individual bets or lines. Picks: term for the expert’s betting selections. PK or Pick: evenly matched teams. Place Bet: a wager where your choice must finish in one of the top designated places. For example, finishing first, second or third in a horserace. Point Spread Bet: betting information for sports is quoted with the point spread or spread on the big board. The spread gives the underdog extra points, thereby challenging the favorite bettor to bet not just on the win, but the win by more than the spread. A bet on the underdog wins if the game is theirs, or if the favorite wins by less than the spread. If the favorite meets the spread exactly, the game is a tie for the point spread bet, and all wagers are returned. You are always laying odds on a point spread bet for whatever side you choose, thereby paying more, e.g. $11 to win $10 and the house gets it vig. Your bet is now locked in for you, regardless of any future changes in the line. You can buy 1/2 point (+ -) usually 3 limit-by accepting the odds that go along with it. Example: to change a spread from +3 to +3 1/2 or from -7 to -6 1/2 on a bet of $100, you must risk $120 to win $100. Price: refers to the odds. Pucks: jargon for game of hockey. Proposition Bets: wagered on a specific element of a sport game. Ex: how many points/goals will be completed. Return: count for your total winnings. Reverse Bets: used in combination with ‘if bets’ for sides or totals. These bets are generally two straight bets and your reverse bet will be the total for each straight bet. If your reverse bet wins, ties or cancels, you then move to a second reverse bet. Round Robin: lingo for 10 bets included in this wager. Rundown: listing of odds on a specific game day. This is Part 2 of 3: SportsBetting Terms Defined.